Bouwmeester BV is a company which develops amphibious machines. 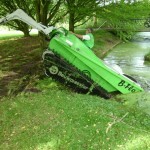 Our Dutch company created a complete new amphibious machine called B-Flo. The B-Flo is an amphibious machine, designed on basis of practical experience and originates from the marshlands of the Netherlands. It's specifically designed for the maintenance and recovery of waterways, marshland, small harbours and ponds. Due to its versatility unique in its kind. The B-Flo is absolutely multifunctional allowing operators to exploit the machine to its full potential. The machine can be used for very several cleaning and maintenance works. The current water level worldwide continues to rise and many water storage must be built. Communities have short time to create a new division between the natural areas in your community. The amphibious machine is completely amphibious, which enables it to move around extremely efficiently in the work area. Marshlands, ditches, pools and lakes can all be crossed with the greatest of ease. It is not possible for the machine to subside or sink. It has a very low ground pressure per cm2, which minimises damage to the work area. Bouwmeester BV can help you to enjoy your new environment. The new B-Flo machine is innovative and has a great quality performance. If you are interested, please contact us here. Website by Convident | Webdevelopment and online marketing.